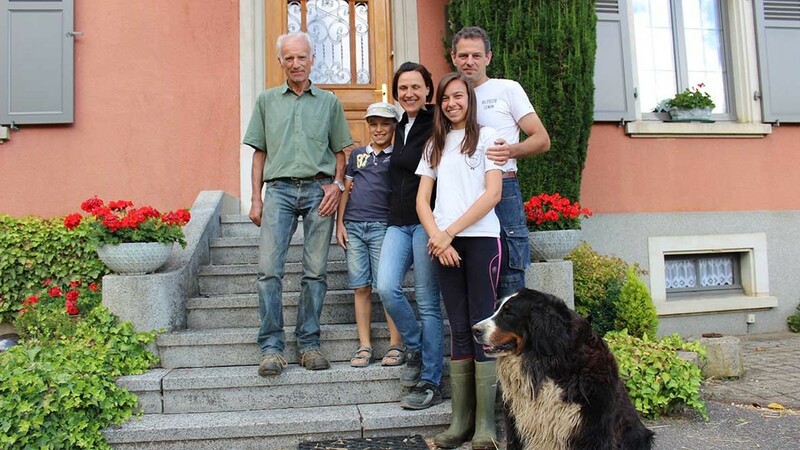 Simmentals are the ultimate dual-purpose breed for a thriving family farming and retail business in Alsace, France. Chloe Palmer meets the Gerster family to find out more. Achieving self-sufficiency in milk and meat to ensure guaranteed provenance and quality for all products sold in their successful farm shop is the goal of the Gerster family. Situated miles from a main road in a small village remote from large centres of population would hardly seem to be the ideal location for a farm retail business. But since they opened 18 years ago, Sandra and Nicolas Gerster have established a loyal customer base of local customers. Mr Gerster says:“We first began selling our products from a bench outside the farmhouse in 1999. It was quite unusual then to sell direct from the farm as the small village butchers were closing down as supermarkets were taking over. The success of the farm shop business is evident as it has expanded to occupy a converted stables and a constant stream of people call in to buy meat and other produce. Male Simmental calves are finished either as veal or as mature animals and sold through the shop. “We converted the buildings in 2006 and now we have a dedicated chilled refinery cellar where we can hang the sausages and other charcuterie products for up to four months,” Mrs Gerster says. All the beef sold in the shop comes from the herd of pedigree Simmental cows which are also milked to supply liquid milk to a French cooperative, Sodiaal. The Simmental produces an average yield of 6,000 litres per year at Grumbach farm, compared to the Montebeliardes making up the remaining 20 per cent of the herd which averages 8,000 litres. “Our cows are milked twice-a-day through a three by three herringbone parlour. It takes around one-and-a-half hours for milking and we sell 230,000 litres of milk to Sodiaal each year with the remaining 100,000 litres being used to feed the veal calves. “We may decide to cease milk production in the next five years and concentrate on our retail business and beef as milk is less profitable for us,” Mr Gerster says. The Simmental has been the main feature at Grumbach farm since the Gerster family moved there in 1949 but the breed has experienced mixed fortunes in the Alsace region of France. Seventy years ago it was the most popular breed for both meat and milk but then almost disappeared as it was replaced by the Holstein and Montebeliarde. “We are one of only two farms within a 20km radius with Simmentals but the breed suits our system,” Mr Gerster adds. Mr Gerster selects sires carefully as he must consider both milk and meat genetic traits. “We have been using AI here for more than 40 years. We select the best sires from French, Austrian and German bloodlines to produce females for the milking herd and males with good carcase traits,” Mr Gerster says. All the females are retained as replacements for the dairy herd which numbers 40 cows. These calves are kept separately until they are seven days old to ensure they receive adequate colostrum sourced individually from their mothers. They are then moved to small groups and fed milk until they are 12 weeks old when they are weaned. “The dairy replacements are then weaned onto hay with some maize and silage and then they are turned out to grass when they are a year old. We do not serve the females until they are two years old because we think the Simmental needs longer to mature,” Mr Gerster adds. Ensuring they have enough replacements for meat and milk production is a challenge, according to Mr Gerster. The bull calves are kept for veal or beef production and are all castrated at two months old. “Our veal calves are loose housed on straw and fed on a diet of milk. We use an automatic feeder and each calf has a microchip in its eartag so the machine can identify it and give only the right allowance of milk per day split into six separate feeds. “We keep them until they are six or seven months old and they are slaughtered at a local abattoir to give a carcase weight of 140kg,” Mr Gerster says. A proportion of the male calves are kept onto maturity but will be turned out to grass over the summer months. Over winter they are fed a mixed ration made up entirely from home-grown wheat, barley, maize and grass silage. “We slaughter at three years old or when the steers reach 800kg liveweight, giving us a carcase of 430kg to 440kg. All the carcases are hung for a minimum of two weeks before we butcher them or use the beef in our charcuterie products,” Mr Gerster explains. 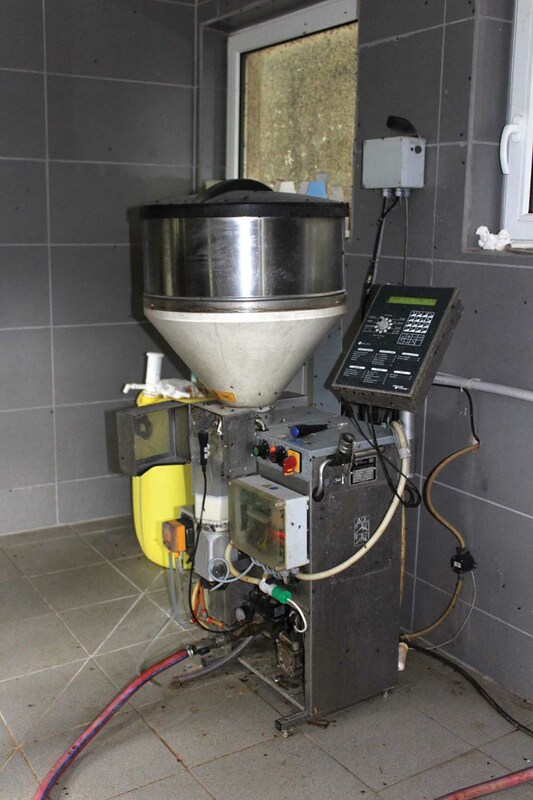 Production at the farm is geared precisely to the demand from the shop. All-year-round calving allows for the production of the required number of calves throughout. “We send on average one mature beef animal and one veal calf for slaughter every fortnight but this week we have sent two steers and a veal calf. We call this process ‘transformation’; where the live animal goes to the abattoir and comes back on the hook,” Mr Gerster explains. The family is evidently at the heart of the business and its ethos and Mr Gerster admits making money is not the principle driver for them. Veal calves are fed with an automatic milk feeder. He says: “We are trying to create a sustainable business which we can hand down to our children. Emma, our daughter, will be studying agriculture at college soon and she now has six years of on-the-job experience helping us with milking, driving the tractors, feeding and working in the shop. Education of the wider French population about agriculture is an important element of the activities at Grumbach Farm, according to Mr Gerster. “More and more people in France are living in towns and they are becoming removed from farming and knowledge of where their food comes from. We think agri-tourism is important so we can educate people about the process of transformation, showing them the production process from start to finish. Reaching out to the customer base is vital for the Gerster family as their relatively isolated location means they rarely benefit from passing trade. “We do not advertise and so most of our customers learn about us by word of mouth. We have to convince them of the value of coming out here to buy so it is all about quality and traceability because we can vouch that all the meat products we sell are fed on feed and forage from the farm,” Mrs Gerster says. Not content with the scale of their success, the Gerster family is already looking to their next venture, building on the recent launch of their outside catering business. “Our plan is to convert the large farm building here into an events venue so we can host and cater for weddings and birthdays here at Grumbach Farm,” Mr Gerster says.